It is no accident that the symbol of Ceará is the jangada (sailing raft). The state has 573 kilometers (356 miles) of beaches, and many here still hold on to coastal fishing traditions. Ceará is sunny almost all year round, with a diverse landscape of dunes, lakes, and mangroves. The coast is one of the most popular tourist destinations in the entire country. 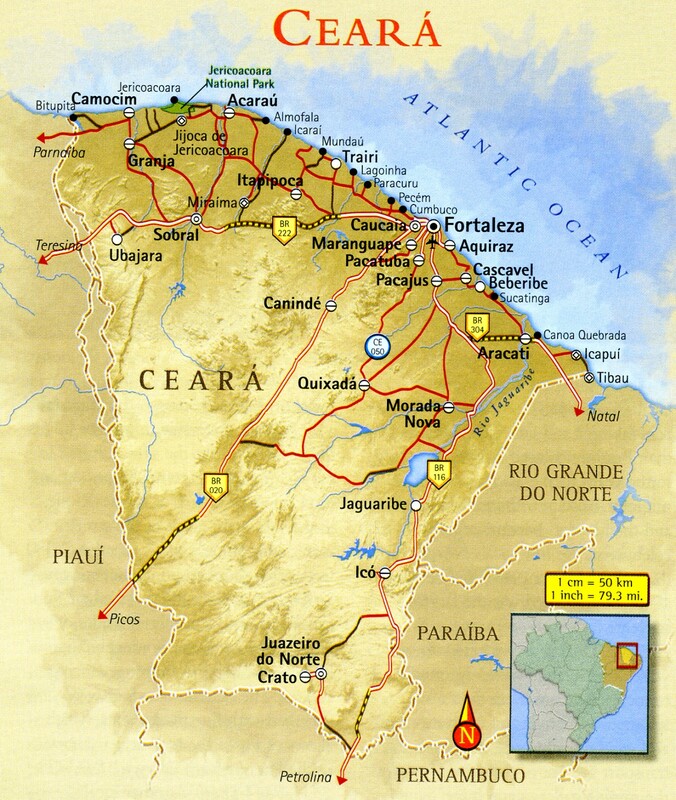 Throughout its history, Ceará has been something of a frontrunner. The Spaniard Vicente Pinzón supposedly arrived on the coast of Mucuripe (now the state capital, Fortaleza) on February 2, 1500, long before Cabral made his first landing in Bahia. The story that locals take most pride in is that of jangadeiro (rafts man) Francisco José do Nascimento, known to many as Dragão do Mar (Sea Dragon). Born in Aracati, on the east coast of Ceará, he managed to prevent the unloading of slaves at Mucuripe – one of the country's most important abolitionist episodes. Indeed, Ceará was the frist province to free its slaves, doing so four years before the government passed the Lei Áurea (federal law freeing slaves). A good example of the state's diversity of cultural treasures is its capital, Fortaleza. A busy metropolis with a vibrant cultural landscape, it is also the starting point for excursions to both the Costa do Sol Nascente (Sunrise Coast, to the east) and the Costa do Sol Poente (Sunset Coast, to the west). Visitors tend to venture inland from here to the sertão. In Fortaleza itself, a major attraction is Juazeiro do Norte, which is the center of public adoration to Father Cicero, a historical figure who is considered to be a saint throughout the Northeast. Sobral, the second-largest city in the state, was founded in 1841. Its well-maintained, rich architectural heritage has given it status as a national historical site. Unlike the rest of the state, where the heat reigns supreme, tiny Ubajara enjoys a mild climate. Sitting at an altitude of 847 meters (2,780 feet) in a mountainous section of Atlantic forest, the town is the gateway to a national park known for its spectacular limestone caves. • The historical and cultural attractions of Fortaleza. • Unspoiled Canoa Quebrada, the jewel of the Costa do Sol Nascente. • Jericoacoara, a cosmopolitan destination that still retains the charming simplicity of the Costa do Sol Poente. • Juazeiro do Norte, in the sertão region of Ceará, site of the biggest pilgrimages in the Northeast. • The historical architecture of Sobral. • The limestone caves of Ubajara National Park. From July to December to enjoy the beaches. Between January and March, the beaches are at their most crowded and prices at their highest. • Between December and May, in the hot, rainy season, to enjoy the fuller lakes, the dunes and the beaches. • From January to June, when Sobral has milder weather. • During the three great pilgrimages honoring Father Cicero: September 15th; from October 30th to November 2nd; and from January 30th to February 2nd.